I love adventurous travel to wild places to create photographs, stop frame animations and video art. After my MFA, I set off for a camping adventure with Alasdair Macfarlane and created a Facebook Group Nomads in Desert to capture some of our troubles. 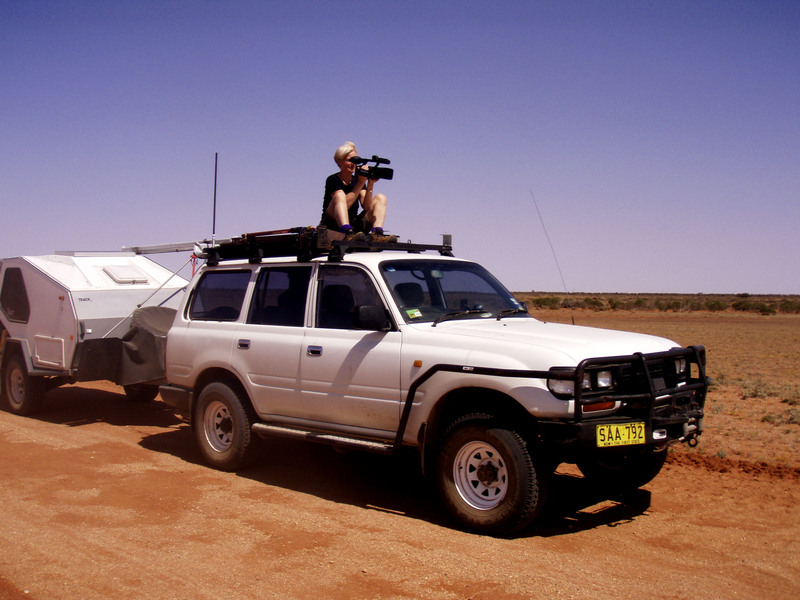 Julia Featherstone Shooting the Long Straight Road Mundi Mundi Plain, NSW 2009. Photo: Alasdair Macfarlane. I love adventurous photography and video recordings. For my MFA about the Australian Desert, I made four camping trips to the desert with photographer Alasdair Macfarlane. In this pic, I’m sitting on the roof of our Toyota Landcruiser holding a Sony HD Z1P video camera. As Alasdair sped down a long straight road, I tried to keep the horizon line steady above the bumpy, corrugated road. After four speedy runs, I succeeded! Photo shows our nomadic set-up with a 4WD and T-van. This perspective book is very relevant to what you have written here. There is a lot about the importance of eye level and the horizon line. I ordered it from The Book Depository.